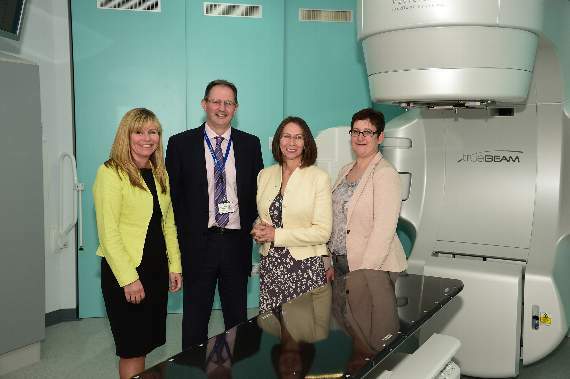 Royal Surrey County Hospital has taken delivery of a brand new state-of-the art radiotherapy machine. The Varian Truebeam linear accelerator arrived at the Trust earlier this year and is the hundredth Truebeam machine installed by the firm in the UK and Ireland. Royal Surrey’s Chair, Sue Sjuve, was joined by clinicians and colleagues from Varian Medical Systems to celebrate receipt of the milestone piece of equipment. Around four in 10 of all NHS cancer patients are treated with radiotherapy, which typically uses high-energy radiation from a machine called a linear accelerator (Linac). Royal Surrey currently runs seven Linac machines over two sites, which are used to treat 3,200 NHS patients each year. The new Linac will replace a machine that is 11 years old with the latest model, ensuring patients continue to benefit from the most up-to-date precision treatments. It is hoped that it will be fully clinically operational and treating patients by early autumn. Sue Sjuve, said: “Modern radiotherapy plays a vital role not only in survival, but also relieving the symptoms of cancer patients. Adele Lyons, Varian Medical Systems’ UK/Ireland sales director added: “The NHS has invested heavily in new radiotherapy and radiosurgery treatment technologies and the UK is the first country in Europe to install 100 TrueBeam systems, our flagship product.